Frieda Bosh DeSoto Jail book in photo. DESOTO—Ten days after the high profile raid of a home belonging to former NBA star Chris Bosh, police have made an arrest. 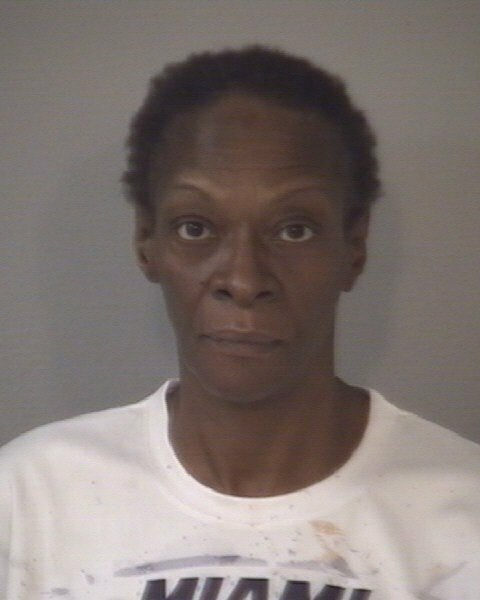 Tuesday DeSoto police took Bosh’s mother Frieda Bosh, 54, into custody without incident. According to a statement from DeSoto Police, Frieda along with housemate Jonathan Brown, was formally charged with Exploitation of a Disabled Person, which is a 3rd degree felony. Bosh, Brown and a third named resident, James Fortune resided together in a gated community near Westmoreland and Wintergreen Roads. Through evidence collected at the scene and interviews, it was determined that Frieda and Brown allowed Fortune to live at the home for monetary profit. The affidavit states that Frieda ordered the victim to relinquish a large portion of his monthly disability check to her to pay rent for himself and Brown. Fortune also says he was intimidated by Brown, and then forced to participate in Brown’s drug ring. Frieda allowed this to occur as a means of obtaining free narcotics and marijuana from Brown, while also allowing narcotics and marijuana be distributed from the North DeSoto home. Since the arrest, Frieda was transported to the DeSoto City Jail where she posted a $10,000 bond and has been released. Brown currently remains in custody at the Tarrant County Jail. On December 8, police executed a search warrant at 902 St. George Place. According to the search warrant, it is the residence of Frieda, but in fact owned by her son Chris Bosh. Surveillance began around the end of October 2017. DeSoto police say they received about 15 resident complaints within a month about activities going on at the residence. Residents report seeing multiple vehicles at the resident making hand-to-hand exchanges in plain view. The search resulted in discovery of cocaine, marijuana, scales, small plastic zip bags, plastic wrap, vacuum sealers, rubber bands and documentation notating narcotics trafficking. Police also found cutting agents, pipes, rolling papers and other items used to ingest controlled substances. Currency consistent with proceeds from the sale or distribution of controlled substances, cell phones, currency counters, weapons and surveillance equipment were also on the property. Members of the DeSoto PD Street Crimes Unity noted 8 different instances throughout the month of November where they stopped cars leaving the St. George Place address with varying amounts of cocaine, marijuana and/or alprazolam (Xanax). Brown who remains in Tarrant County custody has an extensive history of violent criminal behavior. Brown has been arrested for Burglary of a Habitation, Aggravated Robbery, Unlawful Possession of a Firearm by a felon. As well as a charge for aggravated assault where he shot a victim in the face during a drug deal. In July 2013, a property owned by Freida Bosh was in trouble with the law. A warehouse at 1401 S. Ervay St, Dallas was the sight of illegal parties that was allegedly being operated by Bosh’s brother, Joel. Reports say that Freida bought the property in 2008 and had planned to turn it into apartments and later offices but that both plans fell through. Among the types of parties being promoted at the space were wet-t-shirt contests and mud wrestling. While in September 2012, a gun was fired outside the building during a party although nobody was hurt. Chris Bosh has been relatively quiet on the matter. But last week Frieda took to social media to say all these allegations are not true. Rather that her son is in the process of evicting her from the home and she has not been a tenant for the last three months. Furthermore Frieda says that because of the legal fees associated with the eviction case, she has had to rent out the home to cover costly lawyer bills. December 15, Chris Bosh made an appearance in Dallas County Court for an appeal to his October suit to evict his mother. And even though his mother and her attorney didn’t show up, the judge still ruled against the former Miami Heat player. Why? Because Bosh’s notice telling his mother to vacate the property wasn’t “consistent” with the Texas property code’s requirements, Judge Ken Tapscott wrote in his judgment. Freida, owned the 5 bedroom/4 bathroom home for a year before he took over ownership in 2005. According to the Dallas County appraisal district the property is worth more than $335,000.